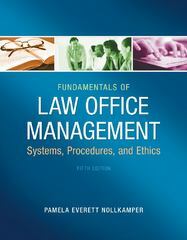 Fundamentals of Law Office Management 5 Edition FUNDAMENTALS OF LAW OFFICE MANAGEMENT, Fifth Edition delivers the skills and knowledge you need to keep a law office running smoothly. In addition to an overview of the legal industry and the many roles paralegals play, the book takes an in-depth look at how legal environments differ from other businesses, including the ethical issues you may face. Discussions on law-specific office functions, such as managing the client funds account, timekeeping, docketing, and maintaining a law library help you understand the scope of a legal practice, while chapters on technology, client relations, and billing reveal the business side. Practical and skills-focused, FUNDAMENTALS OF LAW OFFICE MANAGEMENT, Fifth Editiont provides ample, in-text learning features, such as key words, ethics alerts, side bars, tech tips, and the latest Web references, along with supplemental, online tools for hands-on practice.